Everyone desires to be appreciated, and employees are no exception. 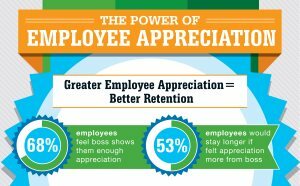 And to demonstrate how greater employee appreciation equals better retention, jobs and career community site Glassdoor just released its Employee Appreciation Survey. The survey of more than 2,000 U.S. adults reveals how appreciated employees feel by their employers, the biggest motivators for workers and what employer-provided perks employees desire most this Thanksgiving. Also, twenty-four percent of employees reported their boss shows more appreciation to employees with more experience, while 23 percent reported that their boss shows more appreciation to newer employees. Company sponsored social event (24 percent; e.g., holiday party, happy hour). Employees want Thanksgiving perks from employers. Sixty-two percent of employees said they would appreciate not being required to work the day before, of and after this Thanksgiving. Check out Glassdoor’s accompanying infographic below.